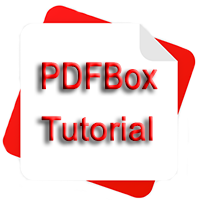 PDFBox Tutorial provides basic and advanced concepts of PDFBox Library. Our PDFBox Tutorial is designed for beginners and professionals both. PDFBox is an open-source library which is written in Java. It supports the development and conversion of PDF Documents. PDFBox Library comes as a JAR file. It allows the creation of new PDF documents, manipulation of existing documents, bookmarking PDF and the ability to extract content from PDF documents. We can also use it to digitally sign, print and validate files against the PDF/A-1b standard. Our PDFBox Tutorial includes all topics of PDFBox Tutorial such as Introduction, Features, Create First PDF Document, Adding Page, Load Existing Document, Adding Text, Adding Multiple Lines, Removing Page, Reading Text, Extracting Phone Number, Working With Metadata, Working with Fonts, Working with Attachments, Inserting Image, Extracting Image, Get Location and size of Image, Adding Rectangles, Splitting PDF Document, Merging PDF Document, Validation, Encrypting PDF Document, etc. Before learning PDFBox Tutorial, you must have the basic knowledge of JAVA Language. Our PDFBox Tutorial is designed to help beginners and professionals. We assure that you will not find any problem in this PDFBox Tutorial. But if there is any mistake, please post the problem in contact form.